Customers, getting customers, grabbing their attention--It is safe to say that business owners know with certainty one thing: clients and customers can be finicky, temperamental and easily distracted. How do you grab the attention of a potential customer, hold on to it, and make an impression? One way is through your marketing materials, specifically a brochure. Many businesses count brochures as a key piece in their marketing arsenal, along with their business cards, direct mail pieces like postcards, and of course their websites. 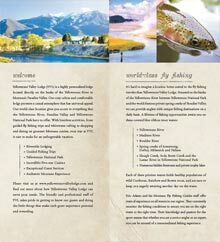 One company that uses brochures to successfully convey the warmth and hospitality of their fly fishing lodge is Yellowstone Valley Lodge, out of Livingston, Montana. Their brochure, a custom size 9 x 16" closed gate fold, uses a folded, closed vertical orientation to achieve two things: ease of placement in standard sized brochure racks and a closed gatefold to maximize real estate of the printed piece. At first glance, the size is similiar to most "rack cards" or other tri-fold brochures, but once an interested customer grabs one, they begin to unfold not once, but two more times, revealing pertinent text and compelling photographs. This piece also uses an often overlooked component of winning printed pieces - the custom paper stock. Printed on a 65# Neenah Sundance Cover Felt, the look and feel of the paper works well with the subject matter—a Montana lodge providing down-home hospitality in a setting with stunning scenery, great fishing and fantastic food and amenities. This "feel" is enhanced by the softer, textured paper stock, which is reminiscent of a well-worn fishing vest. Also, this stock is made with a minimum of 30% post consumer fiber, adding to the environmentally friendly aspect. PFL's customer, Yellowstone Valley Lodge, used a printed background that resembles lightly-worn leather, adding to the richness of the piece, and ultimately, the experience of a stay at the lodge. 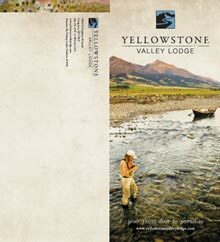 All of the components of the brochure set the stage for a potential guest at the lodge to start seeing themselves in the photographs, whether casting a fly to rising trout, wildlife viewing in Yellowstone National Park or enjoying the great food and landscapes. This is something that a website cannot do, and coupled with the portability of the piece, makes it a perfect reminder for a potential guest to start booking a trip! 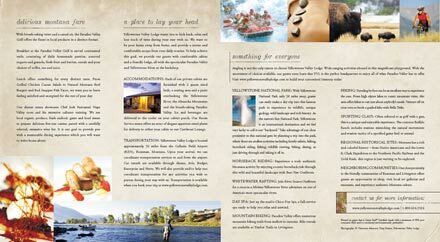 Interested in Creating Your Own Winning Brochure? Adding a brochure to your business's marketing toolbox is a great way to pull in more customers, and if you are ready to get started, give PFL a call today at 800-930-2423 and speak with one of our Technical Service Representatives and get all of your questions answered, or email us at info@printingforless.com. We can help you with paper selection, fold layout, design and mailing services. If you have questions about gate folds, or need help with your brochure, call our design experts at 800-930-2423 or email us at info@printingforless.com.